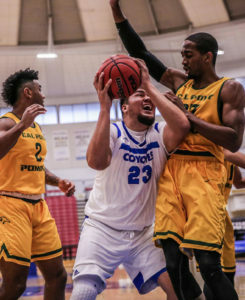 Halfway through the basketball season, Cal State San Bernardino Men’s team is finding their rhythm and consistency under first-year head coach Andy Newman. While the students were on winter break, the Men’s team were competing in non- league tournaments and working hard in practice. That hard work has paid dividends because the team has shown tremendous improvement over winter break, by going an impressive 6-2. Known as the “bulldog”, Andres Villa powers through two Mustang opponents in an attempt to score. Currently sitting at 11- 7 overall and 7-5 in league play, the Coyotes are sitting in fifth place in the California Collegiate Athletic Conference (CCAA), thanks to a 5 game league win streak. An unfortunate tough loss on the road to Cal State Dominguez brought the team back to reality. However, the improvement over winter break has the team optimistic about their future. After starting the season with a team of players that have never played with one another, the Coyotes are still the No.1 defensive team in the nation. With the team allowing 71 points per game and holding the opposition to 36% from the field, the defense is what this team takes pride in. From the point guard position to the 7-foot center in Dante Williams, this team is athletic and has the opportunity to disrupt the opposition every night. They are also improving on the offensive side of the ball every night. Earlier in the year, Coach Newman said he was excited to implement a brand of basketball where they would score a lot of points. Averaging a mere 76 points per game, the offense has done just that. They recently dropped 96 on league opponent Cal State Monterey Bay and 91 on University of St Katherine. However, Coach Newman still believes there is room for growth and improvement on the offensive side. “We should be averaging more points,” Newman said. “We definitely need to not turn the ball over as much and keep trying to get easy points. (not the direct quote) The beautiful thing about this team, is they do not rely on just one player for the offensive production. Led by senior guard Garrett Baggett with 14.3 points and sophomore forward Daytone Jennings at 14.1 points respectively, the team is extremely hard to guard because the points can come from anywhere on the floor. A testament to the Coyotes’ depth is that three players are averaging double figures, with six players averaging at least 8 points. Most notably, is the improvement of Junior forward Andres Villa. Villa was named CAA Player of the week for. 31- Jan. 6. and averaged16.5 points on 67 percent from the field and 8.5 rebounds. The coyotes are peaking at the right time as the heart of conference play is around the corner. The team will look to keep up the disruptive defense and high scoring offense to build momentum heading into the second half of the season. The team is in a good position to make the CCAA playoffs and are looking to sneak into the top four to assure themselves a home game. According to Newman, Making the National playoffs is the priority and expectation.